As the temperatures get cooler, cold and flu season creeps in fast. 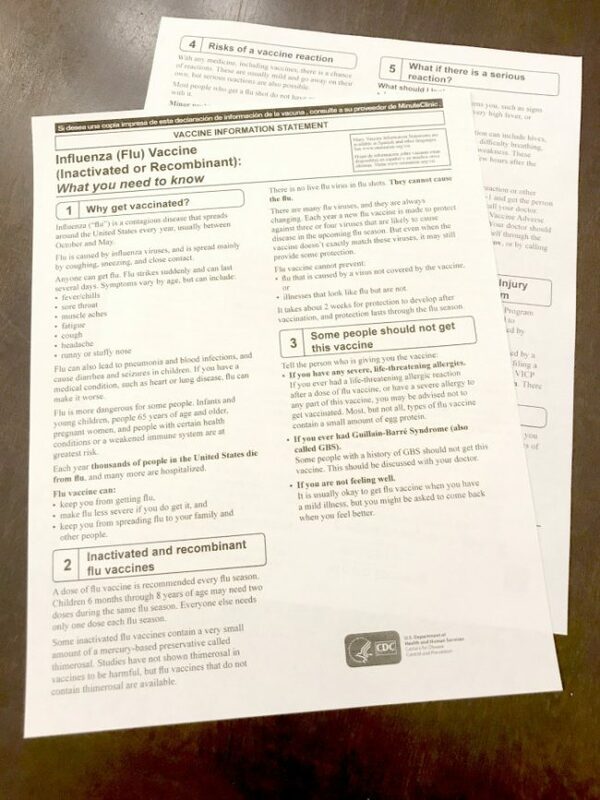 Many people don’t think about getting their flu shot until it is already well into flu season, but you are most protected if you get it before the season starts. 1. Save yourself some sick days. Being sick with the flu is horrible and takes days to recover from even for the healthiest of people. A simple Flu Shot can save you quite a few sick days in the long run. 2. Protect your family and loved ones. By getting the flu shot yourself, you won’t be bringing the sickness into your home. Especially when you have people who are more susceptible to the flu virus (young infants, 65+, secondary health problems, etc.) it is important to not bring that virus around them. Grocery shopping, going to work, taking kids on outings, etc. exposes you to a myriad of germs, the flu virus being one. You can be a little more at ease knowing that you aren’t exposing others to it through your own sickness. 3. You can spread the flu virus even when you aren’t feeling sick. It’s true, you can start spreading the flu virus even before you start having symptoms. So make sure that you are protected from the virus beforehand. 4. You’ll be protected from a few different flu strains for months. The flu virus changes, and you will want to get a new one each year, but there is a lot of research behind what virus strains will be hitting us hard as they prepare the flu vaccine. It is great to know that you have protection from a few different strains throughout the season. 5. It’s easy and almost painless protection. 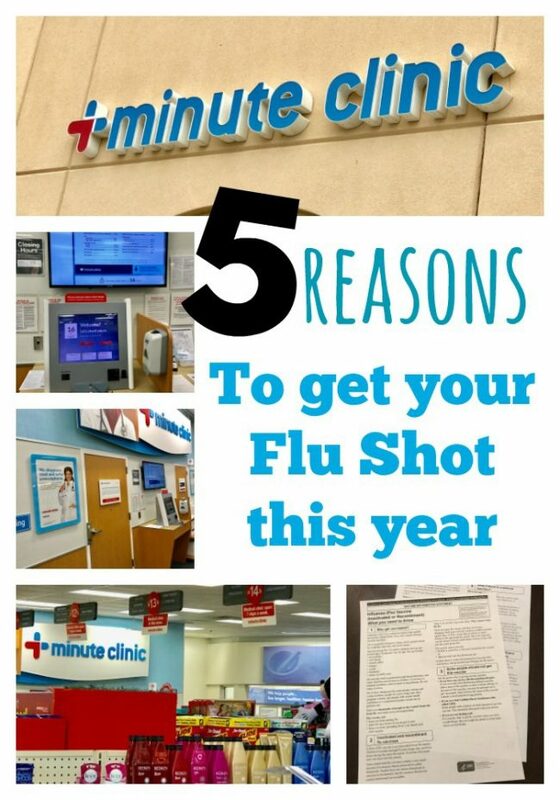 I recently got my flu shot through CVS Minute Clinic and it was a quick and easy experience. They have options that allow you to schedule an appointment or walk-in. With my crazy schedule, walk-in was the easiest. I was in and out in under 20 minutes! 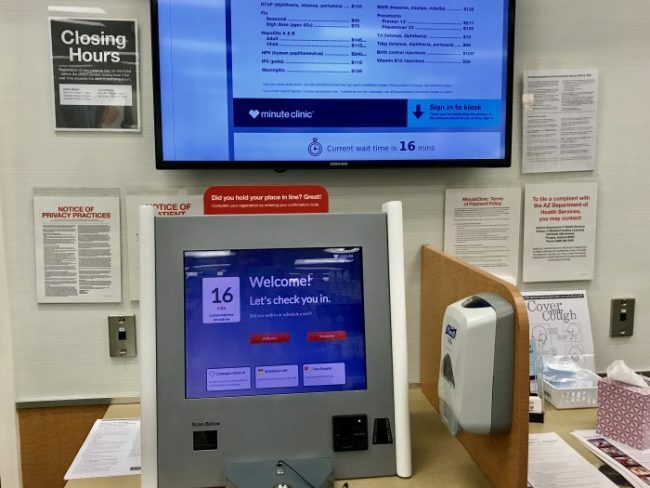 You can easily spot which CVS locations offer a Minute Clinic. They have their sign quite large on the side of the building. Inside, there is an easy to fill in screen that gives them some info about why you are there. You are able to make appointments online and then wait the line at home! I didn’t have an appointment, just walked in, and I was in to see the Nurse Practitioner is less than 10 minutes! The Nurse Practitioner was quite informative. She had lots of information on the vaccine itself, and gave me a few tips and pointers to make the process as easy and painless as possible. A quick, pretty painless shot and I am protected from a few different strains of the flu virus for months! Visiting CVS Minute Clinic was definitely easier for me than scheduling a visit through my regular doctor, making the time for a specific appointment in my day, taking care of childcare during the appointment, waiting it out, and they still sent all the information that happened at my visit to my doctor’s office so my records stay current! Definitely a WIN-WIN for me! I just got mine on Tuesday! Arm is still a little sore, but nothing like how I’d feel if I caught the flu! It’s so nice when places make it quick and easy for you to get flu shots. Makes it nice when you have four kids. I’m a BIG supporter of flu shots! I’m one of the people who have a compromised immune system, so it’s important for me to get them, and those around me often. The more people who get protected against the flu, the safer I am, so I recommend them to everyone! I’m glad that more and more places are offering them so easily like this! The CVS Minute Clinic is such a great resource to stay healthy! I know a few families that have gone there to get the flu shot and they were pleased with the customer service and care. Great points! It’s super easy with MinuteClinic. There’s no way I’m catching the flu this year! I always forget! We are in Florida so I Feel like it doesn’t get “winter” enough, but I know that is not true! We still have to be protected. These are some good tips. I personally do not do the flu shot, but glad to hear about this for others. I think it’s great that many do free flu shots too. The CVS Minute Clinic sounds like a huge time saver. We need to go get our flu shots this week. I will have to look for a location near me. We usually get one because we have a chronic asthmatic in the house, and she’s already had one ICU stay this year, and we don’t want another. I know a lot of people hate the flu shot or think that it makes them sick, but it’s better to be safe than sorry. My family does not do flu shots, but I really do love the Minute Clinic at CVS. THey’ve been a great help in a pinch when the dr cannot see us! Oh my… no excuses! I haven’t gotten my flu shot this year and Minute Clinic makes it way too easy for me not to do it. Thanks!! Half of my family has the flu shot and we are working on the other half right now! Great tips on how to avoid the flu! My sister in law has it right now and she says its nasty! I have never got the flu but it is important to get vaccinated. I am thinking of getting my kids vaccinated and we do this every year without fail. We do not do flu shots, but I do love CVS! 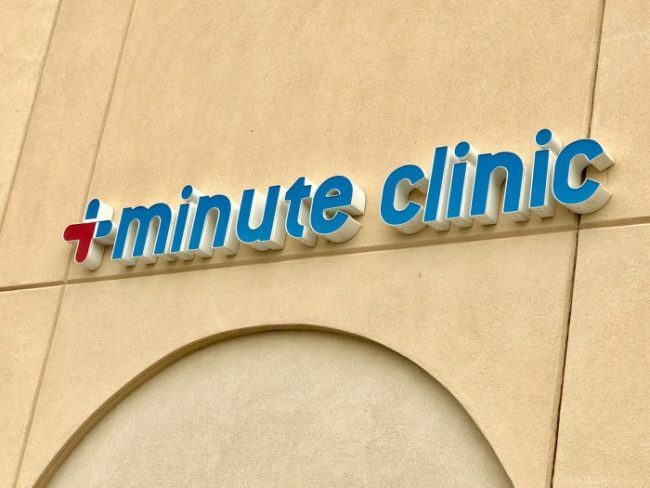 I have never tried the Minute Clinic as of yet! My doctor insists I get it in office whenever he sees it’s due- but I, personally, always have some sort of reaction at the injection site and just feel junky a few days after. Still, I agree that it is important to get. I get my flu shot every year without fail. I skipped it one year, and I ended up with the swine flu. I felt like I was going to die. These are really nice tips to protect the family from FLU in this fall season.